When the High Line opened in 2009, it was an instant hit with both tourists and locals. And it sparked an astonishing development boom all along what would become the mile-and-half-long park, utterly transforming three neighborhoods on Manhattan's lower west side: the Meatpacking District, Chelsea, and Hudson Yards, which is now something of a mini-city all its own. Today the High Line remains an NYC hotspot for visitors, who come for the often-oddball art exhibitions, the influential landscape design, and, increasingly, the many good places nearby to eat and drink. Here’s our round-up of the best. Tucked behind a brick and weathered-steel wall in the back of its far-fancier mothership, Trestle on Tenth, this unassuming sliver of a shop basically only serves one thing: a smoked, roasted, spice-rubbed pork shoulder creation that’s among the very best sandwiches in the city. 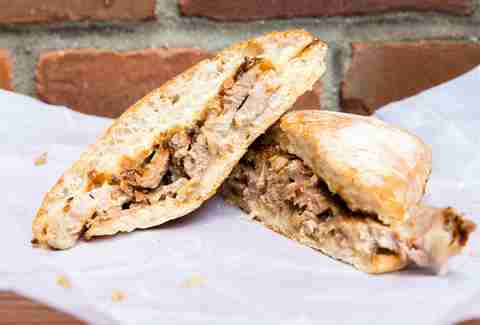 Juicy, fatty, crisp-skinned, and loaded with flavor, the $14 monster is pure piggy heaven. The mound of sweet meat is topped with onion jam, mustard sauce, and hot sauce, all piled between a chewy ciabatta roll that's totally up to the task of holding it all together. It comes with a lively house-made pickle, too. Honorable mentions: The deservedly legendary uni panini at El Quinto Pino at 401 West 24th, and the array of gooey grilled cheeses made to order at the Saxelby counter, located downstairs at the Chelsea Market. Set off to the south from the tourist-clogged main corridor of Chelsea Market, this counter-space spot is best known for its superb halva, always available in several varieties. But while you're here picking up a slab or three of that sesame butter-based treat, make sure to grab a $5 cup of the soft-serve ice cream, Goat Milk Tahini. Made by the good folks at Victory Garden (who sadly closed their shop on Carmine Street in 2016), the frozen dessert is smooth, sweet, and tangy, and goes spectacularly well with the crumbled halva on top. 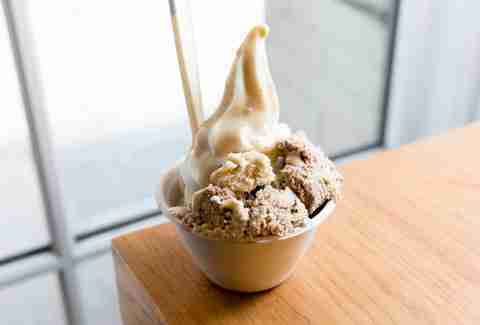 Honorable mention: Ample Hills at 73 Gansevoort, a small Manhattan outpost of the city's best "packed-with-crazy-stuff" ice cream. 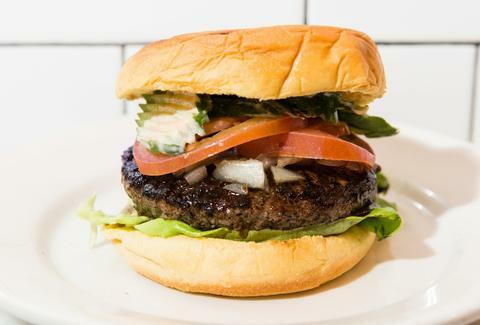 The slick newish Whitmans up at the north end of the High Line may lack the ramshackle charm of the East Village original, but the burgers are just as down-home satisfying. If it's your first time here, get the signature Juicy Lucy ($13), which oozes melted pimento cheese from within a well-charred short rib beef patty, with spicy pickles a nice touch among the standard burger toppings. If you’re feeling more adventurous, the PB&B ($12) is topped with peanut butter and bacon. And no meal at Whitmans is complete without a bowl of its thinly sliced, deftly battered fried pickles. Its sterile-condo facade may look unpromising, and the too-small, slightly awkward interior almost guarantees table waits, but rest assured your gracious hosts Jun and BoMee Park will serve you one of NYC's finest bowls of ramen at Jun-Men. 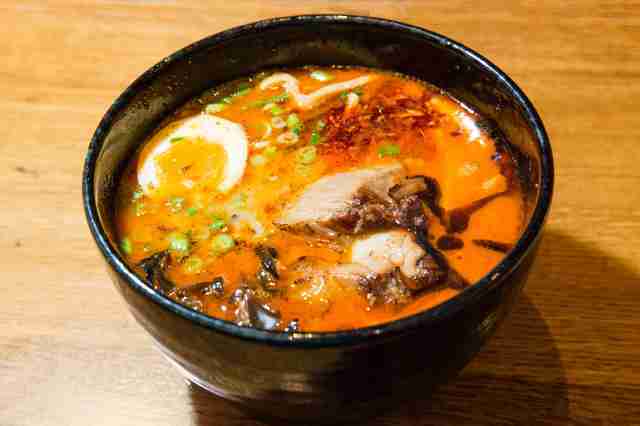 The ramen varieties here are skillfully composed, deeply satisfying, and flat-out delicious: the dense and rich pork bone, the complex spicy miso, the super-fiery kimchi (all $16)... or get the earthy, briny uni mushroom mazemen ($19) for a innovative take on surf ‘n’ turf. Honorable mention: The slapped-on-site noodles -- especially when topped with Tingly Lamb -- at Very Fresh, which has recently moved to a bigger stall in Chelsea Market. Back in 2013, the art-selling superstars Hauser and Wirth opened a cavernous gallery in Chelsea, presenting the works of three generations of Roths (the most famous being Dieter) as the opener. That exhibition is long gone, of course, and the gallery itself has since moved to a new location, but the best part of the show miraculously remains: the secret espresso bar, insanely adorned with all sorts of Dieter Roth art and madness. 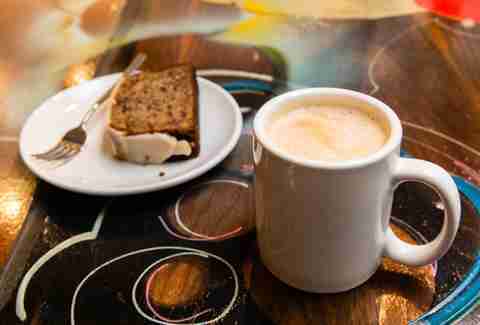 Anyone can stop by any time the gallery's open and enjoy a coffee, absolutely free. Honorable mention: La Colombe at the 27th Terminal Warehouse, which is comfortable, quiet, and serves pastries from City Bakery. In the fall of 2016, the trio behind the highly regarded Los Tacos #1 in Chelsea Market expanded their footprint with this outstanding, beachy-feeling hangout, which specializes in fish tacos that outshine anything you'll find at the meat-based original. The tacos are only $3 each, and they’re as good as any in the city, with fish flaky and flavorful enough to hold its own under multiple sauces and bright, fresh toppings. Another plus: There's a separate entrance on 15th Street, so you don't even have to deal with the Chelsea Market mob scene to get in. Master baker Jim Lahey's sit-down pizza restaurant Co. (usually pronounced "company") opened in 2009, and has been packed almost every night since. 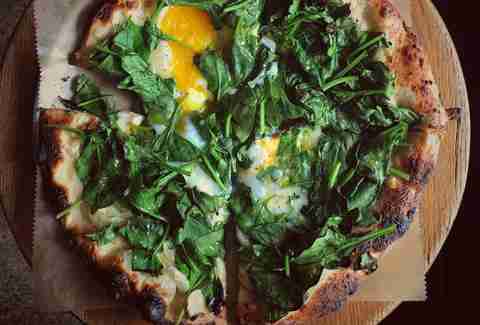 It's not cheap -- the individual pies are small, and run as high as $23 -- but it’s worth it. This is pizza of the gooey, chewy variety, with high-end toppings like shiitake mushrooms, béchamel sauce, fresh leaves of spinach, and slabs of guanciale covering blistered-on-the-edge, floppy-in-the-middle crust. The salads and roasted vegetable plates are top-notch accompaniments, too. The iconic blue-brick facade is covered in layers of graffiti and wheat pastes; the dingy interior looks like it hasn't changed a bit since that "Est 1956" sign was placed out front. Sure, Billymark's West gets plenty of slummers sipping cans of PBR these days, but make no mistake: This is an actual dank-as-hell dive bar, one of a rapidly vanishing breed in Manhattan. With the luxury accommodations of Hudson Yards welcoming residents soon, who knows how much longer we'll even have Billymark's in our life? Go now while you still can, and join the quietly sullen day-drinkers or too-loud nighttime revelers for a bottom-shelf shot and can-of-whatever chaser. The McKittrick Hotel has become something of an entertainment complex, hosting the interactive theatrical experience Sleep No More; the Illusionist's Table (among other things) at the Heath "speakeasy"; and bands playing nightly at the jazzy Manderley Bar. 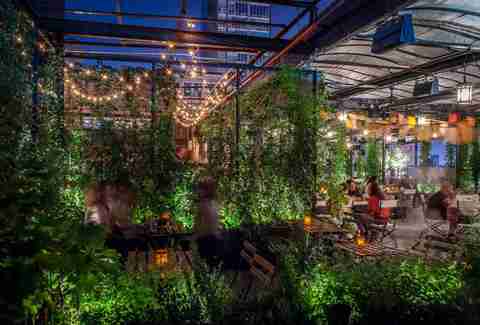 But the best part of the whole shebang might be the hopelessly romantic rooftop cocktail bar, Gallow Green. In the summer, it's covered in dreamy greenery and twinkling lights under the stars; in the winter it becomes a rustic lodge, complete with bunk beds for snuggling and an outdoor fire pit. At any time of year, the oversized fruit punches are just as potent. Popular brunch spots can be more hassle than they're worth, with tedious table waits and frantic service nullifying whatever pleasure those pancakes might bring. Not so with Bubby's. Located at the southern end of High Line right across from the Whitney, Bubby's is predictably packed at all times, but the food’s first-rate, the atmosphere’s friendly, and the drinks are well-mixed. Feast on the hits: the buttermilk biscuits (two for $6), red flannel hash ($24), and jalapeno scramble ($19). 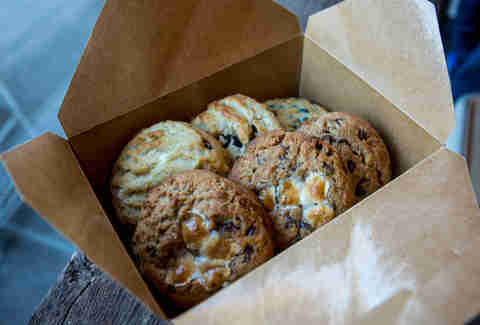 In the summer of 2017, a couple of college buddies opened a tiny cookie shop in Astoria, and became instant neighborhood heroes for their gooey, sweet, monster-size treats. Now the Chip NYC crew is spreading their cookie-love to Manhattan, with a counter at the pretty but often-overlooked Gansevoort Market near the south end of High Line. Every day they bake up to four different varieties -- recent offerings included funfetti, s'mores, blueberry cheesecake, and chocolate chip walnut (each $3.50). No matter the flavor, cookies are cooked "soft" with a doughy center, and loaded with chunky stir-ins. The Whitney Museum has been a huge success from the moment it opened in 2015, so it makes sense that it’s also home to one of the area's great restaurants, the cheekily named Untitled. Renzo Piano's design is sparse but pretty, with soaring floor-to-ceiling windows, and the service is exactly what you’d expect at a high-end Danny Meyer joint: flawless. The food is a delight, a menu of contemporary American dishes that gather together the freshest ingredients in creations like grilled Arctic char and pork adobo. Scott Lynch is a Thrillist contributor.